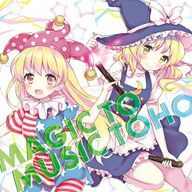 MAGIC TO MUSIC TOHO is a doujin album by IOSYS released on 2015-12-28. It features vocal and instrumental arrangements of themes from Perfect Cherry Blossom, Imperishable Night, Mountain of Faith', Undefined Fantastic Object, Fairy Wars and Legacy of Lunatic Kingdom. This page was last edited on 14 July 2017, at 13:25.